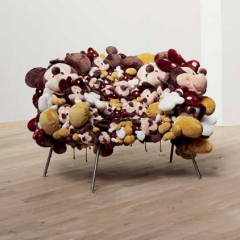 Major works by cutting-edge contemporary designers Ron Arad, Maarten Baas and Arik Levy will be offered at the upcoming Phillips de Pury & Company New York Design sale. Offering some of the finest examples of work done by today’s most important designers alongside rare furniture by Alexander Noll and Swedish design group, Front , Phillips de Pury & Company continues to set the pace for selling design at auction. Proceeds from 17 lots, handpicked by independent curator, Francis Sultana, will benefit the National Society for the Prevention of Cruelty to Children. All proceeds will benefit the NSPCC treatment and therapeutic services.